There are several, but one example is your IRA (Individual Retirement Account). You can actually use your yearly contribution to your IRA to help with lowering your EFC (expected family contribution) and shelter money from the prying eyes of the college FAO (financial aid officer). From January 2nd to April 15th the IRS (Internal Revenue Service) allows you to make contributions to your IRA fund for either tax year (2013 or 2014). If you are married and filing jointly, you can make a contribution of up to $11,000 (up to $13,000 if you’re over the age of 50) for fiscal year 2013. At the same time, you can make the same yearly contributions (up to $11,000 or $13,000 respectively) to your IRA for fiscal year 2014 (see IRS information for more details). By doing this, you will shelter $22,000 (or $26,000 if you’re over 50) from your FAO. The difference can be hundreds of dollars in additional financial aid, plus the added reduction in taxes you’ll receive. The key to sheltering is that you must make these contributions BEFORE you fill out your tax return. Many make the mistake of filling out their tax returns first, then later making an IRA contribution. Several of the online tax services (Turbo Tax, H&R Block, TaxAct, etc.) allow you to run scenarios with your tax returns before filing. Take advantage of these and determine how much you can afford to shelter with your IRA contribution. Again, do it BEFORE submitting your tax return. Want to know other tips, ideas and strategies? 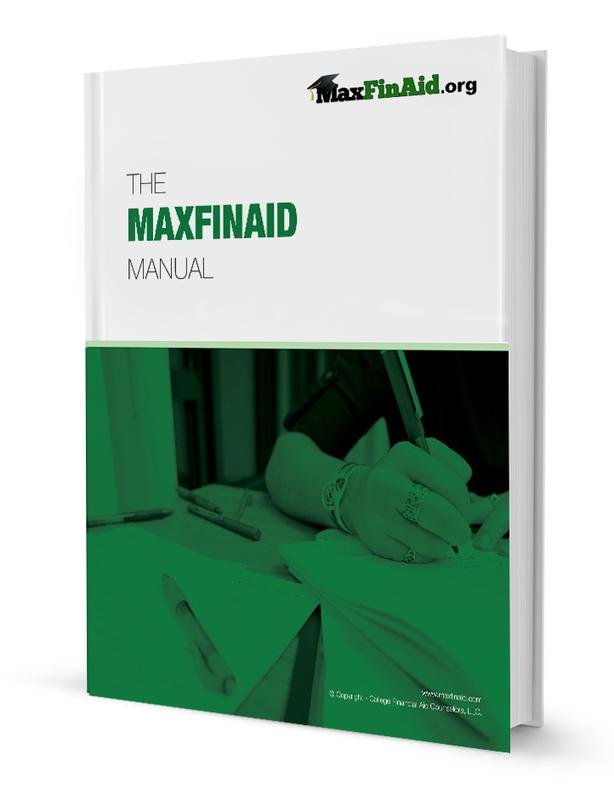 Download the free financial aid manual at MaxFinAid.org. Tax deductible contributions made to retirement accounts (IRAs, 401Ks, etc) DURING BASE INCOME YEARS are counted as untaxed income on the FAFSA, therefore counted as income, and is not protected from the financial aid formulas. It’s all about timing. Contributions should be made prior to the start of your high school student’s junior year so that they will be “sheltered ASSETS”. Please validate your article with the Department of Education. Jackie, thanks for following MaxFinAid so closely. You’re partially right. Yes, retirement contributions are reported on your FAFSA as you said, but no it isn’t revealed to the prying eyes of the FAO (financial aid officer) as the article says. As a strategy, you could concentrate your taxes by NOT contributing to your retirement account during your base years to raise your taxes, thereby, lower your available income. I believe this is what you were suggesting. However, depending on your tax situation, this may or may not help. You could end up paying more in taxes than what you would receive in financial aid. The bottom line is knowing how and when to use your retirement contributions to give you the maximum benefit. That said, the biggest financial mistake we see made by parents is when they pay fees for financial information that is free or pay a "professional" to fill out forms for them that they can do themselves. Avoiding this costly mistake was our motivation in writing the Manual. Our passion is to get this FREE information into the hands of every potential college student, so they can make their own decisions. If you haven’t done so already, please download the free manual on this website for reference. Thanks again for reading!